After trying to conceal his chosen school for college hoops Gino Jumao-as has finally revealed his green and yellow jersey. 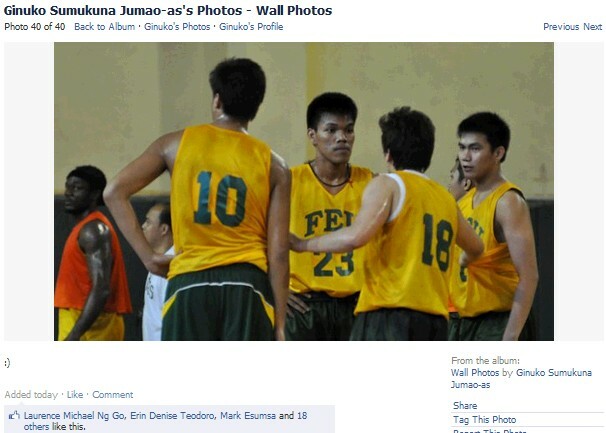 He's now a Tamaraw and that's his picture in his first training day with FEU. FEU looks solid. They have Reil Cerventes manning the power forward spot, Pippo Nuondou manning the center position, Gino Jumao-as manning the shooting guard position, Aldrech Ramos manning the small forward and the Reigning MVP of the UAAP manning the point guard spot. Gino looks happy. He even placed a smiley mark as his caption in the picture. Go FEU!